There is a debate. On one hand is Summers, who argues that modern economies have entered an era of secular stagnation. Full utilization of the factors of production and particularly capital and labor is not possible without stimulating aggregate demand in a way that facilitates bubbles. The broad strokes of the argument can be found implicitly or explicitly in much of the commentary and economic analysis. The other side of the debate includes economists like Bernanke, and Rogoff and Reinhart. Their argument is less abstract. What most modern economies are experiencing, they would say, is what is being experienced is very much consistent with what happens when the credit cycle ends with a financial crisis. It is neither secular nor stagnation. 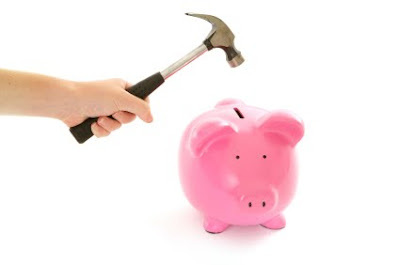 Reinhart and Rogoff argue that recovering from a financial crisis take a while as in years. Households and firms take years to work off the debts that were accumulated. They are not necessarily willing to take on more debt. Financial intermediaries (banks) have non-performing loans and compromised balance sheets and may be hesitant to lend. Regulators, like the proverbial general fitting the last battle, may force banks to adopt higher capital ratios. In a new study, Reinhart and Rogoff focus what happens to GDP per capita in the 100 worst financial crisis since the 1860s. The average drop in GDP per capita was 9.6% (and even more for emerging market economies). They found that on average it took a little more than seven years for advanced economies to return to pre-crisis GDP per capita. The median length of time was six years for the recovery in income. Drawing on the latest IMF World Economic Outlook, the Reinhart summarized the findings in this Great Graphic: It shows that the US and German recovered the quickest. We can appreciate the flexibility of the US economy and its relatively early and aggressive actions to strengthen the banking system (see TARP--not original intention but after re-purposed). The rapid pace of the German recovery may have something to do with EMU and its privileged position. Perhaps the speed of the German recovery is linked to the length of the recovery in other EMU countries. We do not want to digress from the argument at hand. 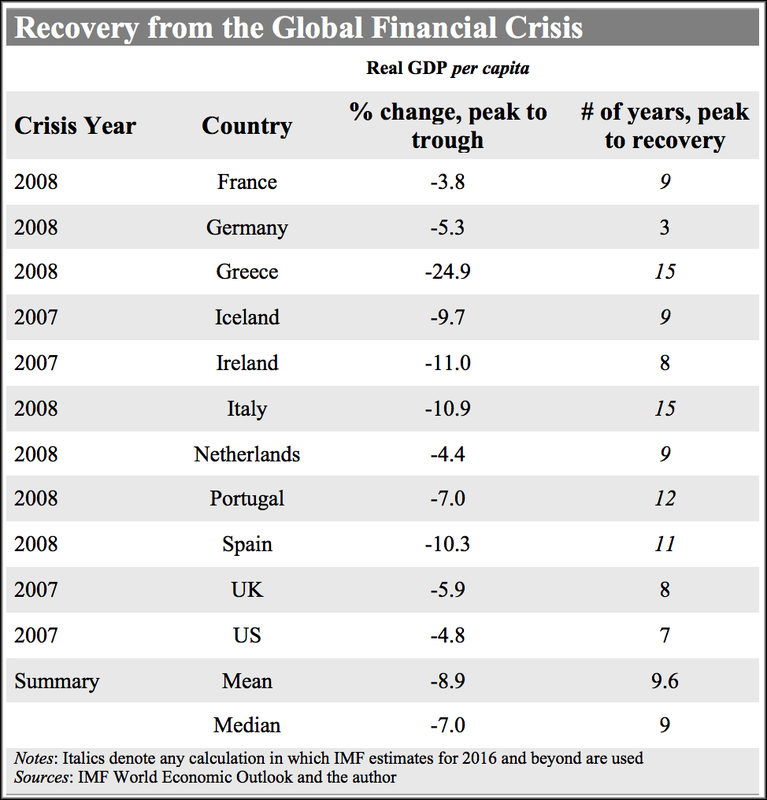 The numbers in italics in the right-hand far column (# of years, peak to recovery) are the IMF's projections. 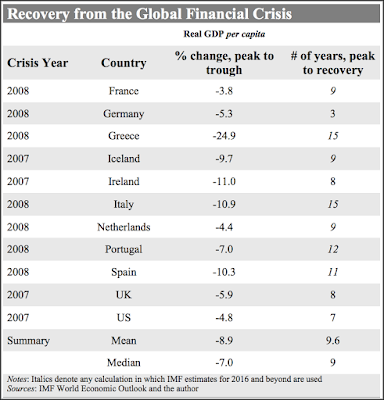 Of the selected 11 countries in the table, the median recovery is about nine years. Taking the IMF projections at face value, by 2021, Greece's per capita income will be about 14% below 2008 levels, and Italy's will be 9% lower. Reinhart argues that the writing off of private debt accumulated during the expansion years is an integral part of resolving financial crises. Rather than seek greater international coordination (e.g., IMF and G20) or large-scale public investment (e.g., Summers, Stiglitz, Krugman), Reinhart argues that what is ultimately holding back the a more robust recovery is the "extend and pretend" practices. In Reinhart and Rogoff's view, the extensive foreclosures in the US enabled a relatively quick recovery from the housing market bubble. They cite the relatively rapid de-leveraging in the Scandinavian crisis in the early 1990s and the Asian financial crisis 1997-1998 as facilitating speedy recoveries. Given the challenges being reported among the German banking system, it does not seem that the speed of its recovery is due to superior approach. The massive amount of debt that China has incurred in recent years has been the subject of both awe and trepidation. The key, for Reinhart and Rogoff, is whether China follows the US and Scandinavian experience or Japan and Europe's approach. One can only hope that China’s approach to dealing with its internal private and sub-sovereign debt does not adhere to the Japanese-eurozone timetable. Extend and pretend lengthens the process and creates all sorts of undesirable secondary effects.